The story ballet is back. And next week, one of the most beloved of all time is swooping into New York -- with a bold, new interpretation by Les Ballets de Monte-Carlo. Directed and choreographed by Jean-Christophe Maillot, Lac is a pithy remix of Swan Lake that keeps the central story intact, but dares to rethink many of the ballet's sacrosanct conventions. The result is a provocative reimagining of the 1877 classic, updated to reflect our times -- not completely black and white, but also various shades of gray. Maillot is one of several renowned choreographers who are contributing to a narrative renaissance in contemporary ballet, after more than half a century dominated by abstraction. In his 20 years at the helm of Les Ballets, Maillot has also created works inspired by The Nutcracker, Sleeping Beauty, Romeo and Juliet, Cinderella, Faust and A Midsummer Night's Dream. His latest narrative work, based on The Taming of the Shrew, will premiere at the Bolshoi this summer. Over the last decade, Alexei Ratmansky, Christopher Wheeldon, Jean Grand-Maître and Pontus Lidberg are just a few of the ballet notables who have also tried their hands at classical narrative. Mats Ek and Matthew Bourne have been at it even longer. Cynics might suggest that the resurgence of the story ballet has had less to do with real creative inspiration, than with selling seats in tough economic times. 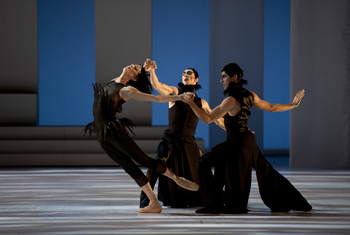 Since Darren Aronofsky's film Black Swan was released in 2010, Swan Lake has been particularly popular. However, these stories don't belong to ballet alone; they are part of a deeper cultural heritage. Embedded in every fairy tale are symbols of society's values, norms and beliefs. As times change -- and as the arts evolve -- it's only natural that these stories should evolve as well. So what inspired Maillot to take on Swan Lake? Last year, I had the chance to speak with him about this in person, following a home-season run of Lac at Monaco's Grimaldi Forum. Story ballet seems to be making a comeback. Why this renewed interest among contemporary choreographers? I think people are realizing that human beings love to have stories. But what makes a lot of story ballet a bit boring and old-fashioned is more the way it's acted than how it's danced. The problem in the past was that the dancing and the acting were split. They would act, most of the time pretty badly, and then they would dance. The dancing was all very nice, but it was so far removed from the story that when they acted, the rupture was so strong that it always looked ridiculous. But if you systematically link the steps to the reason why you are doing them, then you melt the acting into the dance. I don't see why you can't combine the intelligence of searching for new forms and shapes, while telling your story at the same time. In a way, the story becomes a pretext for developing a new way to choreograph. Swan Lake is arguably the most beloved ballet of all time. What inspired you to take it on? I'm pretty obsessed with the relation between men and women. I love to study the permanent confrontation between femininity and masculinity, which is for me the essence of dance. There is this very strong, double action in every single human being, especially in dancers. So I'm always searching for stories that can actually give me the chance to go further in that relation. Swan Lake is this extreme study about what men are attracted to in women. The black swan has to do with the flesh, with desire, with sensuality, with vibration -- with desire that you cannot control. And then the white swan is the absolute purity of love, in the philosophical sense. It's an ideal, a desire that has more to do with the brain than with the body. In the classical Swan Lake, one ballerina performs both white swan and black swan. Why did you choose to have different ballerinas for each role in Lac? I have always been bothered by the fact that it's the same girl doing the two roles, even if I believe all people have those two sides. I thought it was more interesting to split them, to show how the prince's body could be going with the black swan, while at the same time his desire for something more ideal and pure is also very strong. In most versions of Swan Lake, the swans just flutter their arms to suggest wings, but yours wear feathered gloves. How did that idea come to you? I wanted to capture one of the most beautiful things about the story, which is that Odette is swan by day, woman by night. All the other versions -- the classic Petipa, Matthew Bourne, Mats Ek -- the swan is always the same from the beginning to the end. I never see a difference between animal and human. So I started thinking, what could make this difference? And I thought it was the hand. Because with the hands, you can talk, you can greet, you can caresser and you can hit. With the hands, we connect with our humanity. I really wanted to show the audience how frustrating it would be for this white swan not to be able to touch the prince, because she has these awful things that oblige her not to be sensual with her hands. So when she transforms, I want people to feel that something is changing. When she gets her hands back, she can have a love story. She can finally have a relation as a woman. Matthew Bourne made the ultimate gender-bending Swan Lake, but your version also plays with gender. For example, the evil Rothbart character is a woman, and women also perform some of the strongest male variations. I'm a big lover of women. I don't believe in the idea of the dominated, sweet, little woman. I have a deep, deep conviction that there is much more strength in a woman than in a man. For Rothbart -- The Queen of the Night -- Bernice [Coppieters] was my muse. She has this extremely high femininity, but also this strong physicality that can appear like a man's. I'm always inspired by the dancers I work with, because as a choreographer, I do not exist without them. As for the suitors in Act 1 -- of course they're aggressive! They have come to seduce the prince! Here in Monaco, we have a lot of princesses, and I see how they behave to get attention. All the time! It's a reality. You don't just meet someone by accident and then fall in love. It's a decision. You have to know you're special. Many associate Swan Lake with its second act, with its neat formations of pristine swan maidens. But your Act 2 has a darker, more menacing feel. Redoing Act 2 was one of my main attractions to this project. I had no desire to make fun of it or be ironic, like Ek and Bourne, because I love the original version. On the other side, there's this idea that Act 2 is holy. John Neumeier and Rudolph Nureyev, they redid the first and third acts, but they didn't touch the second. When people today watch the second act of Swan Lake, they may be seduced by its purity, but it's difficult to relate to it if you're not connected to dance. There is something that doesn't work in today's world, with its strict organization, lines and structure. So I thought, how can I use the idea of a female corps in a way that reflects how things are today? In a way, the world now is much tougher, much more real. We're no longer in a bubble where everything is sublime. There is something much rougher about the way people express beauty these days. So in approaching the second act, I wanted to rethink how we could adapt the same story, in a way that today's audiences could connect to. Something else you alter is the score. How did you go about abbreviating and reconfiguring it to tell the story you wanted to tell? I was raised as a musician, so for me the music is the base of everything I do. My idea was to avoid using any music that wasn't necessary to the dramatic situation. In all these scores, most of the time there is only an hour and a half of real music; the rest is divertissement that is just there to please. I wanted to also make the point, from the beginning, that I will not use the music the way it's used normally. I know it disturbs some people, especially when they see the black swan in the first act. But that's actually the way it was in the 1877 version! Were there any versions of Swan Lake that you used as a point of reference? Not really. I have my knowledge of Swan Lake. But I will never pretend that I have this knowledge that some people have from studying this version or that version -- I have the knowledge of a dancer who danced it a lot and who's seen it a lot. Like any dancer in the world, it's part of my genetic code. There are some blinks to the original story. But that's just to say, "I know. I know where this is coming from." I'm not pretending to recreate something; I'm doing something else. I'm telling more of a story than there is in the real Swan Lake -- because in a way, it was one of the first abstract ballets, where the story didn't really matter. But if you do look at the story, it's actually pretty ridiculous! For me, if I want to tell a story, then let's really tell a story. Let's try to get into it so people can get excited -- almost like they're watching theater. You do tell more of a story, but the ending also leaves room for doubt. Without giving away too much, can you comment on how you chose to end it? I left it open, because I don't think that evil or the good is ever really winning. I like that the ending of Lac leaves people with a question -- was it good or bad? There is no big hope at the end -- more of a tragic feeling, but it's not definitive. It is possible to think that a little light could come back up. And I believe that's always the case. Lac (After Swan Lake) is running March 14-16 at New York City Center. For more information, visit www.nycitycenter.org.